Recently discharge from the military, Jin-Woo (Yoo Ah-In) is a popular actor. Gyung-A (Lee Mi-Yeon) is a screenwriter for television drama series. She doesn't want to ask Jin-Woo, but asks him anyways to perform in her next drama series. Jin-Woo turns down her offer. At a wedding, Jin-Woo sees Gyung-A's young child Bom. Jin-Woo wonders if he is the father. Sung-Chan (Kim Ju-Hyeok) runs a small Japanese restaurant. Before his wedding, he leases an apartment from flight attendant Joo-Ran (Choi Ji-Woo), but Sung-Chan is dumped by his fiancé. At the same time, flight attendant Joo-Ran learns that she was ripped off and now doesn't have a place to stay. Sung-Chan offers to share the apartment with her. Soo-Ho (Kang Ha-Neul) is a songwriter. He is also deaf from a car accident that he was involved in high school. Soo-Ho has never had a girlfriend. He is a regular customer at Sung-Chan's Japanese restaurant. One day, at Sung-Chan's restaurant, he meets drama series producer Na-Yeon (Esom). They have a good time eating and drinking together. After exchanging messages on Facebook, Soo-Ho and Na-Yeon go on a few dates together. Soo-Ho is unable to tell her about his hearing disability. Created this thread because this movie so romantic ! The love story between three main character so unique ! "LIKE FOR LIKES" Group selfie ! 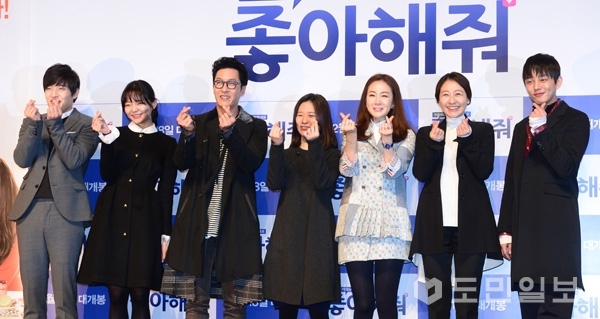 Korean film “Like for Likes” which was released Wednesday grossed 12.2 million won ($10,000) on the first day as of evening, according to the Korean Film Council. 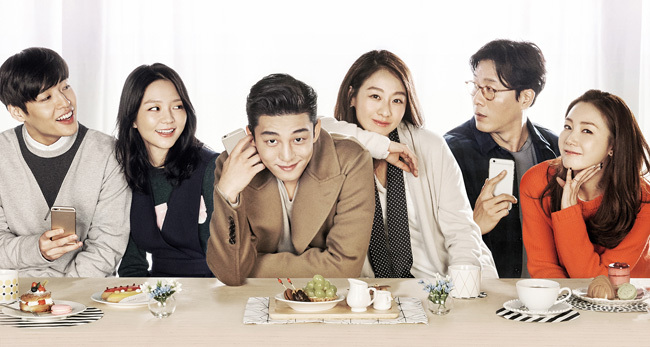 The homegrown rom-com stars actors Yoo Ah-in, Kang Ha-neul and Kim Joo-hyuk and actresses Lee Mi-yeon, E Som and Choi Ji-woo. The omnibus movie puts the spotlight on three couples whose love burgeons on social media, with protagonists from diverse background “liking” their counterparts’ online posts. Yoo and Lee; Kang and E Son; Kim and Choi pair up in the movie. I just finished watching this movie... very recommended !!!!! Another romance movie, the concept is similar to english movie "Love Actually" starred by Hugh Grant. this movie base story also about love relationship between several different couple but somehow they are linked together with each other. Also This movie the only one for yoo ah in having happy ending ! I love the love story that own by Kang Haneul in this movie. A deaf but able to create a wonderful music. Yes. That why i really love him here. .
Me too, i dont realize he was deaf first. But the cAmera always focused on kim ju-hyeok lips if haneul talk to him. But all couple had their unique love story here. Very recommended movie ! When your job forcing you to be "flatterer" to makes your senior happy. Hahaha. . If you just waiting for 2 days, some of fans waiting for 1 month. (Including me) i watch raw 3 times, and reading recap and reviews. Only for yoo ah in ❤️ indonesia subtittle ready. I said I check for the subs EVERY two days. I've been waiting for this movie since last year when it was announced. Just watch raw first then..i already watch with indo sub i think indo fans love this movie alot, that why indo sub out first. Can we watch it online wit Eng subs? Do you know where? Thanks. Hello! Just saw movie with eng subs (u can find it here subscene).